The Patriots returned home to face the Minnesota Vikings in a game that was very important to both teams. And this one was dominated by the Pats defense, they held Minnesota to just 10 points and just three in the second half. The Vikings duo of Adam Thielen and Stefon Diggs was held in check extremely effectively by the NE secondary. The Patriots offense rolled up 471 yards to just 278 for Minnesota. The win puts the Patriots at 9-3 for their 18th straight winning season which is second in NFL history to the Cowboys who had 21 straight winning seasons. Tom Brady, mostly threw underneath to the backs and WRs on screen passes and quick throws which really gouged the Minnesota defense. When the Vikings began to adapt their looks and adjust, Brady then moved the ball down the field. He finished 24-32 for 311 yards (9.7-yard average which is great) with 1 TD and 1 INT for a 102.5 passer rating. Brady’s movement in the pocket was superb, he felt the pressure and would slide or step up in the pocket. On his one pick, he was hit by Harrison Smith as he was letting go of the ball. Against one of the better defenses in the league, this was a very good performance. Brady didn’t make any what we’d characterize as “great” throws, but he got everyone involved and kept the chains moving. But he was very good and kept the Vikings off balance. The Patriots running backs played a huge role in this game, they combined for 40 carries and catches on the day. James White had a big day with 6 carries for 26 yards and 7 catches for 92 more. Sony Michel didn’t have the biggest day with only a 3.7-yard average but he ran hard and was going against one of the better run defenses (3rd) in the league. Rex Burkhead returned from IR and had a good solid complementary effort. Overall, the Patriots ran for 160 yards on 39 carries which is a 4.1-yard average. While good anytime, against the Vikings defense, that is a very big game. It shows the coaches have faith in the running game and the players. Contrast that to what Minnesota did with just 13 rushes on the day. James Develin had a pair of touchdowns from the one and the two-yard lines. The team may have found what ails them in the red zone and short-yardage. The wide receivers, for the most part, had a pretty quiet game. Josh Gordon wasn’t even targeted until the closing moments of the 3rd Quarter. And then in the blink of an eye, Gordon has three catches for 58 yards and a touchdown as well as drawing a pass interference penalty. Julian Edelman was quiet in the passing game (3 catches, 25 yards) but added 35 more in the running game. Chris Hogan had a pair of catches on two targets and Patterson had a big day, rushing, receiving and returning kickoffs for 114 yards total. Phillip Dorsett wasn’t targeted. Rob Gronkowski was quiet in the passing game (3 catches, 26 yards) but was his usual beast-like self in the running game opening holes for the running backs. He also got flagged for a couple of penalties for a false start and holding. The offensive line did a tremendous job considering the defense they were going up against. Minnesota entered the game with the third overall defense, 4th against the run, 5th against the pass and the Pats rolled up 471 yards. The offensive line opened enough holes in the running game for the Pats to run for 160 yards. The pass protection, while solid wasn’t really tested much as Brady was throwing quick passes and the misdirection plays and screens kept the Vikings on their heels. But when they did throw downfield later in the game, they did a tremendous job against one of the better defensive units in the league. The defensive line had a very solid night. They were mixing and matching and shifting players around to bring pressure on Kirk Cousins and they sacrificed their run defense in order to take away what the Vikings do best. Trey Flowers and Lawrence Guy both turned in excellent games. Adam Butler and Adrian Clayborn both contributed and the front seven were a constant disruption of the Vikings offense all night long. The Patriots dusted off their muddled front with at times only Flowers as the only down lineman, and with others Flowers and Butler. And BTW, Guy stopped Murray short on that 4th and 1, I still don’t think Murray has made the sticks yet. Awful call. The Patriots linebackers easily had their best game of the season. With the coverage downfield solid, Cousins was forced to check down to his running backs which is a weakness of the LB unit right? Well on Sunday night. Dalvin Cook had eight catches, for just 22 yards. Latavius Murray had two catches for three yards. All three of the linebackers (Kyle Van Noy, Dont’a Hightower and Elandon Roberts) were all over the field. They were tackling receivers with no yards after the catch and rushing up in the rush against the QB. Roberts set the tone early with a thunderous hit on Cook on the first snap. But he was victimized twice on runs over running the hole and those two plays went for 50 yards on the ground. While that knocks down the grade a bit, Roberts was all over the field and was hitting everything in sight. The secondary was terrific. Adam Thielen came in with nine 100-yard games and the Patriots held him to just five catches for 28 yards and a score. The Patriots doubled him most of the game which took him effectively out of the game plan. Stephon Gilmore was very effective on Stefon Diggs and the team felt confident enough in rookie J.C. Jackson that they slid him over on Diggs as well. That allowed them to get creative on third downs. Jason McCourty largely covered Thielen in the slot which then allowed the Pats to move the bigger Jackson outside. The safeties, Devin McCourty, Jason McCourty, Patrick Chung, Duron Harmon and Obi Melifonwu were very active and they confused Cousins with their crowding things up with their looks down low in the box. It all played a hand in how they limited the Vikings to just 201 yards thru the air. Jonathan Jones and Duron Harmon had interceptions. The Special Teams was lauded by Belichick after the game for their results in the kicking game. Ryan Allen had another strong game pinning the Vikings inside the 10 and angling his punts along the sideline. Cordarrelle Patterson and Julian Edelman both had nice returns of 34 and 23 respectively. Jonathan Jones may have influenced a missed FG with his breaking thru the line. But they also gave up big returns in the kicking game and Brandon King got whistled for a hold that wiped out a nice punt return. The Patriots coaching staff came up with a terrific game plan to take on the Vikings and the players executed it extremely well. There was no doubt that the Patriots were ready for this one, right from the opening snap. Brian Flores had a very aggressive game plan on tap right from the start and they didn’t deviate from it, even when the Vikings made them pay for it on their only touchdown drive of the game just before halftime. Josh McDaniels was trying to take away the Vikings pass rush early in this one with screens, quick passes, and misdirection, and the defense was never able to assert itself in this game. They had their moments when they sputtered but going 7-14 on third down and 2-3 in the red zone against the Vikings defense, numbers which would have been even better if the referees called an interference on Edelman on third and goal (but we digress). Bill Belichick had a firm hold on this one throughout. The team was prepared and they all executed the game plan in fine fashion. 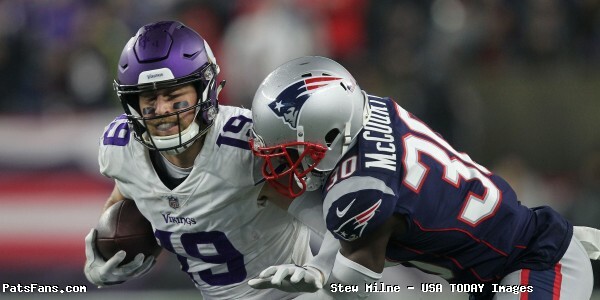 This entry was posted in 2018 Patriots Regular Season, NFL Commentary, NFL News, Patriots Commentary, Patriots Film Room, Patriots News and tagged 2018 Patriots season, Adam Thielen, Bill Belichick, Chris Hogan, Devin McCourty, Dont'a Hightower, Elandon Roberts, James White, Jason McCourty, Julian Edelman, Kirk Cousins, Kyle Van Noy, Minnesota Vikings, New England Patriots, NFL, Patriots, Patriots edge rushers, Rex Burkhead, Rob Gronkowski, Sony Michel, Stefon Diggs, Stephon Gilmore, Tom Brady, Trey Flowers on December 4, 2018 by Steve Balestrieri.